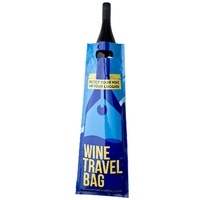 Wine Travel Bag - travel with wine worry-free with 25% off. Offer extended until 30th January 2018. Warm up your credit cards and come on in, as here is where you will find all the BerserkerDay offers - open to EVERYONE who loves wine. Apologize to your spouse or significant other ahead of time. 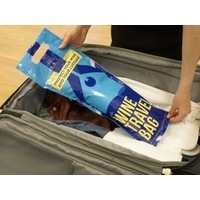 Wine Travel Bag is an affordable, lightweight and reusable carry bag designed to protect both your wine and your luggage when in transit, whether it be in plane car, train, boat or in your suitcase/luggage. 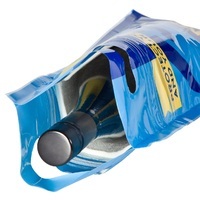 This practical item features custom-designed ultra absorbent material inside the bag to safeguard your precious bottle. The material acts as an instant sponge in the unfortunate occasion a bottle breaks, while a unique leak-proof seal safely contains liquid. The leak-proof seal not only contains one, but two custom-designed zip locks of the highest grade available on the market and can be carried anywhere and be used time and time again to enjoy one’s bottle of choice at their end destination. Last edited by Rhett D on January 28th, 2018, 9:43 pm, edited 1 time in total. in - been looking for something like this, great timing. My avatar is a twelfth century Berserker Lewis rook, from the British Museum. "He stands armed with a sword and exposes his huge teeth with which he bites into his shield. It is this gesture that identifies him as a Berserker – a fierce warrior drawn from Norse mythology that bites his shield in a self-induced frenzy prior to battle." This looks cool and is something I would use! I might have to get some of these for the upcoming trip to Belize, since I can only take one Wine Check and there are 7 of us! Thanks everyone for the positive feedback. 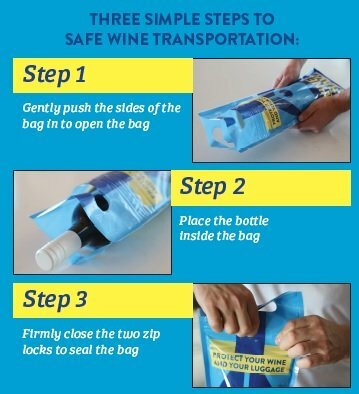 We created the Wine Travel Bag due to a personal disaster I had with a bottle breaking in my suitcase - an absolute painful experience, so we wanted to create a product that was of high quality but affordable that we could make available to every wine lover. It took us 18 months of product development but its been a winner across the world, so for those who purchase them we hope you get lots of use as they are reusable! Order in for three. Useful. I wonder if they fit champagne size and long germans? Although tough to bust the bubbles bottles. Very cool! Bought a 5 pack so we can celebrate our anniversary in New Orleans as well as find some gems in Spain and Italy this Fall. A quién tiene buen vino no le faltan amigos. Looks good. Bought 16. We give away wine as raffle prizes at conventions so this will allow the winners to take away the wine more safely. In for a 3 pack for our upcoming Napa trip, thanks for the offer! Rhett, your website keeps changing my order to Australian dollars when I try to check out! Peter Simpson wrote: Rhett, your website keeps changing my order to Australian dollars when I try to check out! You would have noticed that on the final page the is went from USD to AUD. This is because the head office is based in Australia but rest assured you are charged the same amount in USD even though the final page is AUD. This is how the currency converter works on the site. Bought a 5 pack myself as I like to bring a bottle on long work trips or when I visit family, and always worry about breakage. Thanks! Is the credit card charge in US or AUD $? Steve Gautier wrote: Is the credit card charge in US or AUD $? It would be in AUD, otherwise PayPal is another option. Eric Sch wrote: Bought a 5 pack myself as I like to bring a bottle on long work trips or when I visit family, and always worry about breakage. Thanks! Thanks for your support Eric. You'll love them. It's make traveling with wine a lot less stressful! Jake Rubash wrote: In for a 3 pack for our upcoming Napa trip, thanks for the offer! Marshall Gelb wrote: Very cool! Bought a 5 pack so we can celebrate our anniversary in New Orleans as well as find some gems in Spain and Italy this Fall. Thanks Marshall. I am sure you'll love them and have a great upcoming anniversary too! Grabbed a 5-Pack, didn't even realise you were an Australian based company, I am always travelling with bottles in my luggage (usually wrapped in my jeans) and hope/pray Qantas baggage handlers don't play pass the footy with my bags. Dave English wrote: Grabbed a 5-Pack, didn't even realise you were an Australian based company, I am always travelling with bottles in my luggage (usually wrapped in my jeans) and hope/pray Qantas baggage handlers don't play pass the footy with my bags. Thanks Dave for your order. I can talk from personal experience and can tell you there is nothing worse than having a bottle of wine smash in your suitcase when on holiday! WarrenLoui wrote: Looks good. Bought 16. We give away wine as raffle prizes at conventions so this will allow the winners to take away the wine more safely. For those who missed out we'll be extending our offer for 25% off until 30th January. Rhett, IMHO you'd be much better off if you figured out a way for American customers to complete their purchase in US$. I almost abandoned my purchase on checkout when the price jumped up, and then when I realized you were forcing me into a credit card foreign exchange transaction in Australian dollars I did abandon it. It's only because I was able to talk to you here that I went back and completed the purchase. Americans are not that familiar with AUD, and will react negatively. Also those familiar with cc forex transactions will expect to get ripped off on the exchange rate, or be charged an exorbitant foreign exchange transaction fee. You have a great product, why not make it easy to buy? Peter Simpson wrote: Rhett, IMHO you'd be much better off if you figured out a way for American customers to complete their purchase in US$. I almost abandoned my purchase on checkout when the price jumped up, and then when I realized you were forcing me into a credit card foreign exchange transaction in Australian dollars I did abandon it. Thanks Peter for the feedback. We are currently looking for a US distributor for our product which will then allow us to work with the distributer in creating a separate site with the final checkout page in USD. Unfortunately most sites these days only allow checkout to be in one currency but we’ll definitely have a solution soon. Just wanted to report my first successful use of these as they are now my go-to solution for combining offlines/BYOB dinners, etc with work trips. Found that two bottles now fit great in a standard roll-aboard with my typical 3-4 days of clothes (YMMV! ), meaning I only have to check in one direction. I previously traveled with a 2-bottle shipper, meaning I needed a bigger bag and therefore checked both directions. Quick tip, found it was much easier to get the bottle in the bag if you pulled the sleeve halfway out first. Derek P wrote: Just wanted to report my first successful use of these as they are now my go-to solution for combining offlines/BYOB dinners, etc with work trips. Thank you much for the feedback and we're so glad you happy with our Wine Travel Bags!